These are as pretty as they are tasty. 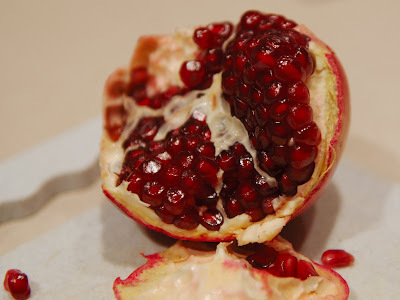 Pomegranates - tart-sweet and juicy. Not a fruit you get to eat every day, but I have been enjoying them since they showed up in the stores this fall. Somehow, I feel "healthier" after eating the juicy arils (that's the ruby red seed-like nodules). That was part one of today's joy. Part two is the news I received from my friend Mark, announcing the arrival of his new bundle joy, Priti, baby girl, born on Wednesday. 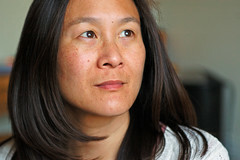 Priti (pronounced "preethee") is the first baby for Mark and his wife, Anita. What a joyous event, even more special during the holiday season. Don't you just love them! I will be sad to them go until next season. Arils, huh? Whatever they are - I love them! Great picture!